And here is my episode two :)Remember my episode one at here when I started by baking the most popular and traditional Castella cake recipe from Just One Cookbook? It is the most popular recipe because it is always the first recipe that I see whenever I searched for "Castella cake recipe" at Google. I like it but it is not THE Castella cake that I'm after. Is beating the eggs separately make a better Castella cake? And I can tell you that my answer is YES!!! I baked this using the popular recipe from Just One Cookbook at here. Same baking temperature and time. Only one difference - different mixing method. And I have yielded this totally different cake!!! Instead of using the traditional way of beating the whole eggs and sugar until mixture is thick, pale and voluminous, I separated the eggs into yolks and whites and beat the whites only until stiff peaks. Then, I combined both yolk and white mixtures together, baked and I got a nicer cake! To illustrate further, you might want to watch me baking this cake in this one-minute video. Then compare the mixing steps with this one-minute video that I have baked my previous Castella cake. Taste-wise and texture-wise, this cake is so much nicer, being smoother and dense with fine chewy crumbs and it does NOT taste like the light and fluffy like the spongy Castella cake that I baked before at here and here. For my curiosity, I choose not to brush the top layer of this cake with honey and yet it is still moist, smooth and good. Even way moister than the previous cake that is baked with traditional mixing method and also brushed with honey! Look at the fine and densely packed crumbs of this cake! It is so smooth and gorgeous! It is like a honey pound cake, smooth and dense with fine chewy bouncy crumbs. 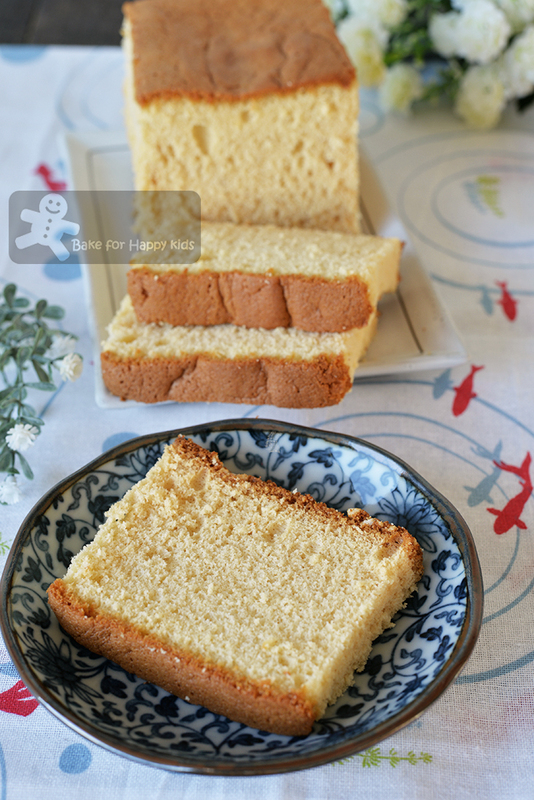 With no addition of oil or any fat and no brushing of honey on the top layer, this cake is surprisingly so moist without any greasy touch or taste. Is it the end of my Castella cake cake baking adventure? 1. Is the addition of oil or butter or even cake stabiliser required to bake a typically good Castella cake? Personally, I like to avoid using cake stabiliser as much as I can. 2. Will the heating of whole eggs to 38°C before beating them with sugar will create a different and better kind of texture? 3. 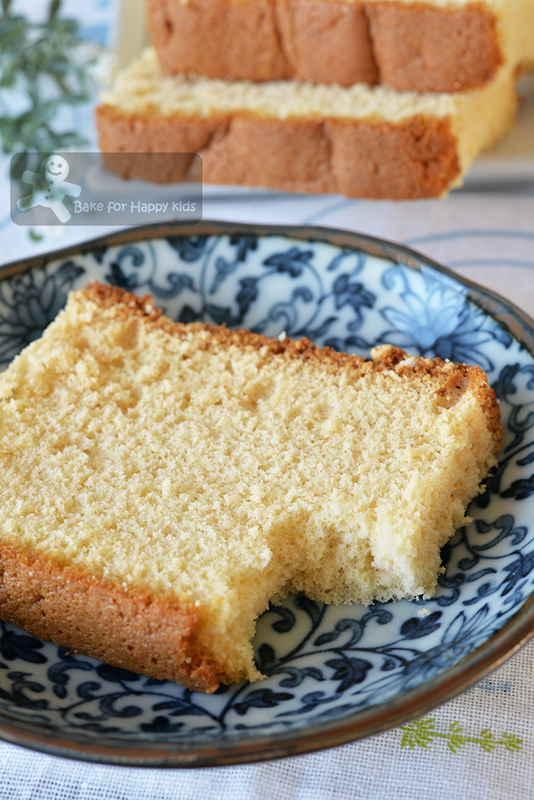 If there any other recipes that will make a better Castella cake? Is there any Castella cake recipes that are fail proof too? If you are a Castella cake enthusiast like me, I'm more than happy to tell you more that I know in my subsequent Castella cake posts. So stay tune. For this post, here's the recipe that is very modified from here using the egg separation method. Using an electric mixer with a whisk attachment, beat egg whites in medium low speed until foamy. Increase beating speed to medium (NOT too high to avoid large bubbles forming). While beating, add sugar gradually and continue to beat until stiff peaks form and the meringue should look glossy and smooth with very fine bubbles. Do not over beat the mixture. Place pan in the middle rack and bake for 10 mins. Decrease temperature to 140°C / 285°F and bake for another 60 mins, or until the cake is thoroughly cooked and must has a nice golden brown top. NOTE: (1) To be on the safe side, it is always better to over-bake your cake slightly than under-baking it because the uncooked cakes will shrink into a short yucky gummy cake after cooling. To gauge, you will see that the cake is ready when it bounce back after it is lightly pressed with your finger. An inserted skewer or cake tester is not a good gauge to see if the cake is thoroughly cooked. (2) Different oven is different. To optimize your baking, you might wish to try other oven temperature setting that I have mentioned earlier in this post. Allow the cake to cool with the foil for about 10 mins first. Remove the cake out of the pan, peel off the foil and the baking paper at its bottom and wrap the cake in plastic wrap. Place cake in an airtight container or a zip lock bag and allow it to rest in room temperature so that the cake will moisten by itself for at least one day. The cake is the best to eat on the next day of bake and even up to the 3rd and 4th day of bake. Where did you get the mould from, Zoe? I live in Melbourne too. A very kind and generous friend from Malaysia gave me this mould. I asked her where can I buy it and she said taobao. If you can't find it, you can use a standard loaf pan to bake too. Zoe, I can see that the texture of this cake is finer. The other one looks rougher with bigger holes. Somehow, egg separation method gives good results like for butter cake. It is worth the extra effort. I stopped by at your blog fortunately. This is authentic kasutera cake. I have once made casutera using the electric rice cooker.